What Clementines Can Teach Surgeons : Shots - Health News A piece of fruit can be a terrific stand-in for a patient during doctors' surgical training. And while there are high-tech simulators on the market, one researcher believes skills crucial to minimally invasive surgery might be better taught with something as simple as a clementine. The clementine on the left was operated on by a skilled surgeon. A nonsurgeon operated on the other one. Clementines and pelvic anatomy are two things you probably wouldn't ever talk about in the same sentence, unless you're Pamela Andreatta. Andreatta, a medical educator at the University of Michigan Medical School, knows all about how people learn. And lately, she's been spending a lot of time scrutinizing how residents are taught to do minimally invasive surgery. In particular, she's been looking at how doctors master laparoscopic surgery, performed with a camera and surgical instruments inserted through tiny incisions in the body. "We can do better — much better," she says. The traditional apprentice model of learning by watching then doing is putting young doctors in operating rooms before they've mastered basic skills, she says. And while there are surgical simulators on the market, including high-tech digital systems offering a virtual reality, she believes the skills crucial to laparoscopic surgery might be better taught with something as simple as a clementine. The idea came to Andreatta after a colleague in gynecologic oncology asked whether she could come up with a simulation to teach the delicate task of removing lymph nodes, something done to minimize the spread of cancer. She considered the fact that throughout the pelvic anatomy, there is a mix of substantial and delicate tissue. And then she thought about a clementine. It has a sturdy outer peel, but also the more fragile pith, the white spongy layer under the skin. Andreatta set up an exercise using an opaque box with holes in the top through which you can insert a camera, scissors and grasper. She invited residents, medical students and faculty to dissect clementines. 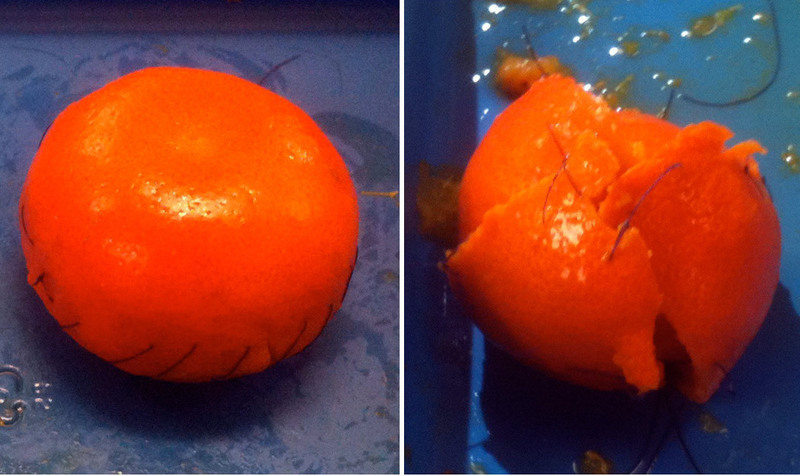 They had to take off the peel in as few pieces as possible, remove the pith, separate the segments, then put everything back together and suture the peel closed. They had two hours to complete the task. Andreatta designed a complex scoring system, which took into consideration the finished state of the fruit, each person's planning and clinical judgment, plus some other factors. In all, 41 people dissected clementines. The minimally invasive surgery specialists scored the highest, by far. Residents and nonsurgical faculty scored significantly lower. Medical students, with little or no surgical experience, fared worst. The results, Andreatta says, confirm that the clementine is a suitable model for training. Faculty surgeons backed up that assertion, remarking on the similarities between the simulation and actual surgery. The clementine is in fact just one of several dozen low-cost simulations Andreatta has developed for teaching minimally invasive surgery. Another uses colorful foam shapes purchased from a craft store. Her hope is that at the University of Michigan and elsewhere, the training boxes, clementines and foam pieces can be placed in offices and hospital call rooms, so that residents and faculty can practice whenever a free moment arises. Moreover, Andreatta says, these models can work just about anywhere. Already, she's taken them to Ghana, where the University of Michigan supports a laparoscopic surgery training center. "You can find clementines or setsumas or tangerine variations all over the world," Andreatta says. "You can go out and pick them off a tree, and it costs very little or nothing... and yet it's very advanced training."